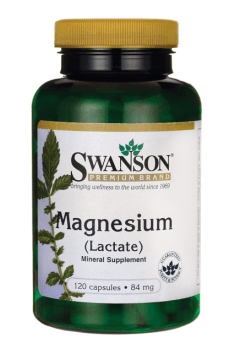 Swanson Magnesium Lactate is a dietary supplement which provides up to 84 mg of magnesium in the form of magnesium lactate. Lactates are one of the best absorbable forms of minerals. They are derived from a combination of an element and lactic acid. They are characterised by ideal bioavailability and absorption. They easily dissolve in the digestive tract, are rapidly absorbed and extremely well tolerated by the body system. Magnesium (Mg) belongs to the most valuable bioelements and plays various important roles in the body system. It participates in all of the most important enzymatic reactions and is a cofactor for the massive group (more than 320) of enzymes. The particularly important role of magnesium is the activation of enzymes responsible for energy production in cells. The largest quantities of magnesium in the body system are accumulated in bones. The rest is present in muscles, soft tissues and intercellular liquids. The greatest demand for magnesium have the cells of the hardest working organs: heart, brain and muscles, so magnesium deficiencies in the first place are signalled by the disorders of these organ functions. Magnesium is essential for mineralisation and proper development of bones. It activates the enzymes from the phosphatase group by accelerating growth and remodelling of bones. It strengthens bones and increases their resistance to fracture. Magnesium closely interacts with calcium; it determines its metabolism in bones and increases the activity of vitamin D, which is responsible for proper calcium absorption. Magnesium shows sedative properties. It relieves symptoms caused by prolonged stress (fears, tension) and facilitates falling asleep. It reduces excitability of nerve cells and ensures the proper conduction of nerve impulses. Magnesium regulates muscle tension and is responsible for the processes of their contraction. It determines the proper heart functioning. Magnesium deficiencies can be indicated by a painful cramps (especially calve cramps), muscle stiffness or twitching. The properly high level of magnesium in the body system is essential for the prevention of cardiovascular diseases. Magnesium minimizes the risk of clot formation, due to the ability to prevent the clumping of blood platelets. Moreover, it maintains the optimal condition of the vascular smooth muscles. It improves their functioning, determines the proper muscle relaxation, thereby increasing blood circulation and reducing the pressure exerted on arteries. The presence of magnesium is necessary for the synthesis of enzymes and digestive juices. This element determines the effectiveness of nutrient transfer into bloodstream. Magnesium helps to maintain hormonal balance in the body system. It affects the secretion of adrenaline (the main hormone produced by the adrenal cortex), calcitonin and parathyroid hormone (hormones involved in calcium metabolism) as well as is essential for the synthesis of insulin. Magnesium deficiencies destabilise the female hormonal system and are responsible for many of the symptoms of premenstrual syndrome. Studies have demonstrated that increasing the level of magnesium in the body system contributes to the reduction in such ailments as mood swings, breast tenderness or weight gain. Magnesium enhances the natural defence of the body system. It accelerates maturation of lymphocytes and improves the process of phagocytosis. It is estimated that almost 100% of the population suffer from magnesium deficiency. The reasons for magnesium deficiencies are a poor ill-balanced diet, excessive consumption of coffee and tea (the xanthine compounds present in these drinks increase the consumption of magnesium in metabolic processes and its urinary excretion) and drinking large amounts of Cola drinks (phosphoric acid present in these drinks reduces absorption of magnesium). The magnesium resources of the body system are also reduced by the use of stimulants (alcohol and nicotine) and chronic stress. They can be also caused by intense physical effort, as profuse sweating accelerates the loss of valuable minerals. Magnesium Lactate is the best choice for anyone who wants to make up the deficiencies of magnesium in the body system. The product is especially recommended for people exposed to prolonged stress or intense physical effort. High dose and perfectly absorbable form guarantee efficacy and safety for the body system. ProbioBalance Woman Balance 20 mld. An effective probiotic with fiber restoring the normal bacterial flora and supporting the human body.